Red Power for the new Mk8 ST! Brand new for the 1.5T Mk8 Fiesta ST is the Scorpion Non-Valved Non-Resonated GPF back exhaust system, this is the non-valved version of the two systems Scorpion produce for that extra bit of engine noise. Want to extract a little more power from your car? A GPF back system is the perfect compromise, leaving the factory catalysts (where fitted) in place and bolting directly to the OEM system. All Scorpion exhausts are designed for improved gasflow and sound, but leave the car fully road legal and MOT ready when the time comes. 70mm pipework removes any restrictions in the stock exhaust system and the twin 90mm Daytona tips fill the gap in the rear bumper perfectly. Why a GPF back and not a catback system? The new ST has what's known as a Gasoline Particulate Filter as well as a catalyst, both of which are required under the new stricter emmisions rules. This system simply fits after the GPF to maintain the STs brilliant emmisions figures and mean it won't fail any MOTs. The Pumaspeed Workshop team are ready to fit the Scorpion Fiesta ST Mk8 GPF Back Non-Valved Exhaust in our Head Office located here. Therefore making parts and labour a total cost £614.99 (inc. VAT). 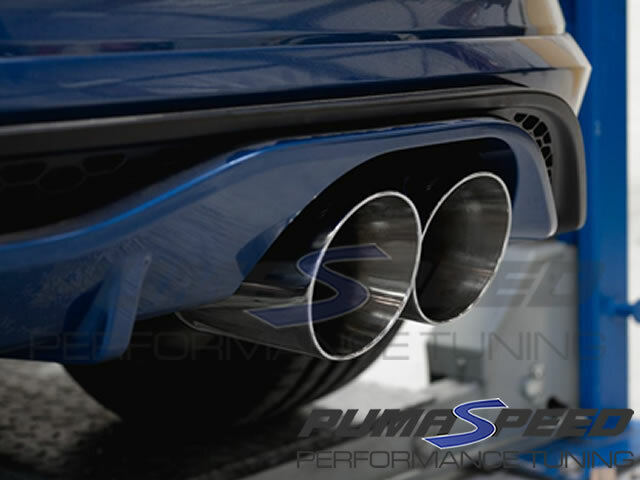 Pumaspeed have a specialist distribution team that can dispatch the Scorpion Fiesta ST Mk8 GPF Back Non-Valved Exhaust to any destination worldwide.